I’ve been in a get my life on track kick because I’ve got a book to write and I can’t seem to write it. So I’ve been reading books to get other aspects of my life in order. I had heard about the book Made to Crave from the Proverbs 31 devotions I get every morning. But I resisted getting the book, because, well, I’ve tried diets before and they worked–for a while. And then, the pounds would return as if they had been on a short vacation and couldn’t wait to get back home. But this book is different. There are no dietary guidelines. The author shares her heart and her pain and what she doesn’t eat–sugar and other carbs. I had already given up wheat, chicken and dairy and did see weight loss while eating just about everything else. And when I added those items back in, my weight ballooned almost instantly, and I experienced other digestive problems as well. So I’ve removed them from my diet again. And I don’t miss them really. I’m a satisfied eater when I removed these items. I eat steak every chance I get. I highly recommend this book, even if you don’t have an issue with weight. (Oh, and it practically has its own contemporary musical score–I had to share a passage with my husband and he smiled). 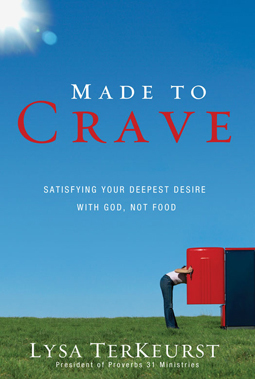 Crave Jesus—and all these things will be added unto you. Allellu, Alleluia.